Low-Income Seniors To Be Ousted As Homes Shopped to For-Profit Buyers: Ald. [From left] Ald. James Cappleman (46th) and Ald. Tom Tunney (44th) oppose plans to close three Chicago residences that provide affordable housing for about 100 senior citizens. 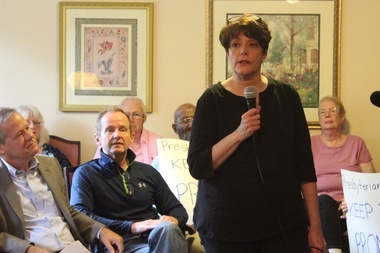 LAKEVIEW — After being promised they could live at Crowder Place for the rest of their lives, senior citizens were distraught to learn of plans to shut down the residence and two others like it in the city. Presbyterian Homes alerted more than 100 low-income residents in its three Chicago residences to the closings in an Aug. 13 letter, giving them until November 2016 to move. The close-knit community was stunned. "These people are walking around in a state of shock," said Crowder Place resident Betty Holcomb. "I was told — as most of us in this building were — that I would never have to look for housing again. As long as I lived here, this was my home." Betty Holcomb says she planned to live in the Crowder Place affordable senior living residence for the rest of her life, before Presbyterian Homes announced it was closing the location next year. In addition to Crowder, 3801 N. Pine Grove Ave., Presbyterian Homes plans to close their another Lakeview location, Peter Mulvey Place, 416 W. Barry Ave. Devon Place, 1950 W. Devon Ave., in Rogers Park also will close. The not-for-profit, faith-based organization has retirement communities in Evanston, Lake Forest and Arlington Heights, which will remain open. The news was first reported by the Sun-Times last week. Displacing the residents is "absurd," Ald. James Cappleman (46th) said Friday. The alderman said he was "shocked" to learn from residents that the affordable housing was going to be sold to market-rate developers. "As we started to demand answers, it became very clear to us that there had been a plan in place a long time ago, but never did they tell any of us," Cappleman said. Cappleman and Ald. Tom Tunney (44th) spoke out Friday in support of residents, imploring Presbyterian Homes to work with them to find a developer who would maintain the affordable housing for low-income seniors. "The problem is time. If we could slow down this process a little bit, we think we can maintain this affordability," Tunney said. While putting together a new plan with the city's help could take two or three months, both aldermen said they know affordable housing developers that could keep the residents where they are. "How many do you want? We'll give you that many interested buyers," Cappleman pledged. The aldermen met three weeks ago with Presbyterian Homes, ONE Northside and city departments to seek a delay in the process and a better solution for the residents. Tunney said they felt the Presbyterian Homes was "disingenuous" about its desire to work together. While its top executives denied the properties were sold, "it felt to me, as a business person myself, that the deal was done," he said. And, ultimately, "by law, we cannot force them" to keep the housing affordable, Cappleman said. Presbyterian Homes told residents the rent-subsidized apartments were no longer financially sustainable. Anticipated maintenance and capital expenditures, "along with current operating deficits," would overwhelm its Geneva Foundation Outreach Fund, which supports the program. Two officials with Presbyterian Homes did not return requests for comment. Along with a year's notice, the company is promising to pay residents $1,500 for moving expenses and continue rent subsidies for a year. If residents leave before November 2016, they will receive the unused subsidy. Cappleman said the company wrongly believed it could not sell the properties to affordable developers without losing money. "Subsidies will make up for that. But our understanding is they aren't willing to cooperate with affordable buyers," he said. 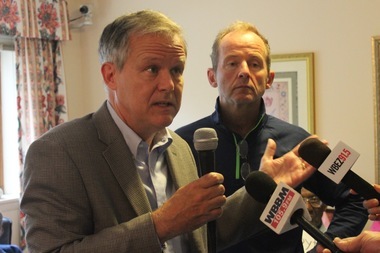 Presbyterian Homes is "supposed to be about compassion and charity, and yet they're in a huge hurry to displace these residents and turn it over to for-profit developers," Cappleman said. Tunney added that the building was in good condition, eliminating the need for expensive renovations — unlike the former Diplomat Hotel, which was fully renovated in 2014 and reopened as the affordable housing complex Buffet Place. Both aldermen said there is a desperate need for affordable housing for the residents, who dread leaving their homes and the community they've built over a lifetime on the North Side. "This has been a place from God, a blessing for us all. And these people are losing their neighborhood. This is the fabric of their lives. They need to be here," Holcomb said.